Very local, but there are two areas of occurrence: the southern half of England and Wales from where there are few recent records, and more recently Inverness-shire and Perthshire in central Scotland. It is widespread in north-western and central Europe, but has not been recorded from Ireland. Damp deciduous woodland in the south, well vegetated bog in the north. A. alsine is usually found on grasses and other low vegetation in damp, sheltered woodland clearings, or in stands of Bog Myrtle Myrica gale. The spider spins its web in this low herbage, and occupies a small conical retreat, consisting of silk and one or two curled, dry leaves, at the top of the web. 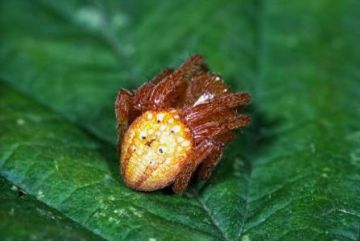 Even though the spider is of a conspicuous orange to deep red colour it is often overlooked in its habitat. Females are adult from June to October whilst mature males are generally found in June and July. The species is widespread but very local. It has been discovered recently in several new sites in Scotland, and this unobtrusive spider may prove to be more widespread, especially in the north. The loss of damp semi-natural woodland habitat to intensive forestry practice, and lack of suitable management to maintain its particular habitat within the woodland structure. Drainage of bogs. Maintenance of existing sheltered clearings and their associated ground layer within established woodland where the spider is found, particularly where there is some moisture in the ground, would be of benefit. Creation of new clearings on a similar basis would possibly encourage the extension of the spider's presence within its current lowland sites.